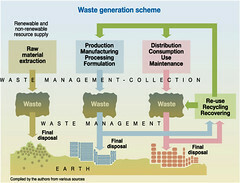 The graphic gives a general illustration of a waste generation & management scheme. Using car production as a example, the associated text includes references as follows: Raw Materials: Mining of minerals: copper, iron, lead, zinc, and aluminum (generating waste in the neighborhood of the mines), etc. Production: During the final assembly: paints, coatings, lubricants and fluids (generating excess materials – a specific type of waste) Distribution: Assembled cars are transported to dealerships (generating air emissions). Factories, assembly plants, road systems, etc. require land to be cleared, resulting in deforestation, degradation of habitat for wildlife and an increase in rainwater runoff. 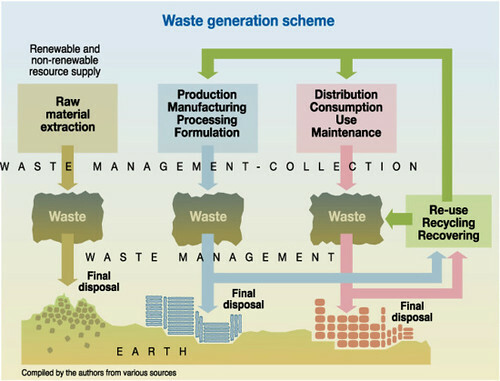 Consumption: Maintenance and repair of cars generates a large range of hazardous waste: fuel, oil, lubricants, etc. and other products such as acids and chemicals. Recycling or disposal: 3/4 of a car is in theory recyclable, but far less is actually reclaimed. 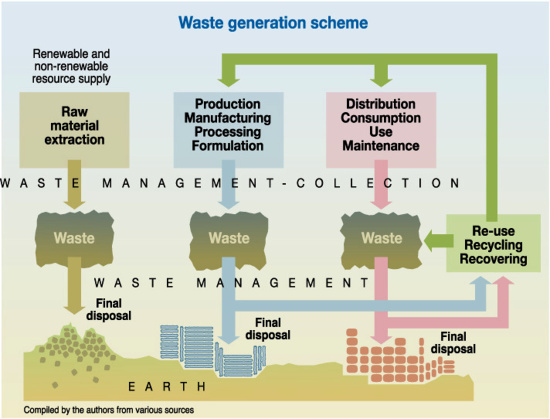 Cars are either partly recycled or simply disposed of (waste consuming large areas). The steel, iron, and aluminum rate highest in reuse. Plastics, which are increasingly used in cars, pose numerous problems for recycling because of the great variety of plastic formulations and the lack of an economically feasible processing program.